Bromberg’s is a locally-owned and operated jewelry store that has been in Birmingham for over 100 years. They have a strong repeat client base but wanted to grow their market share with a younger demographic. 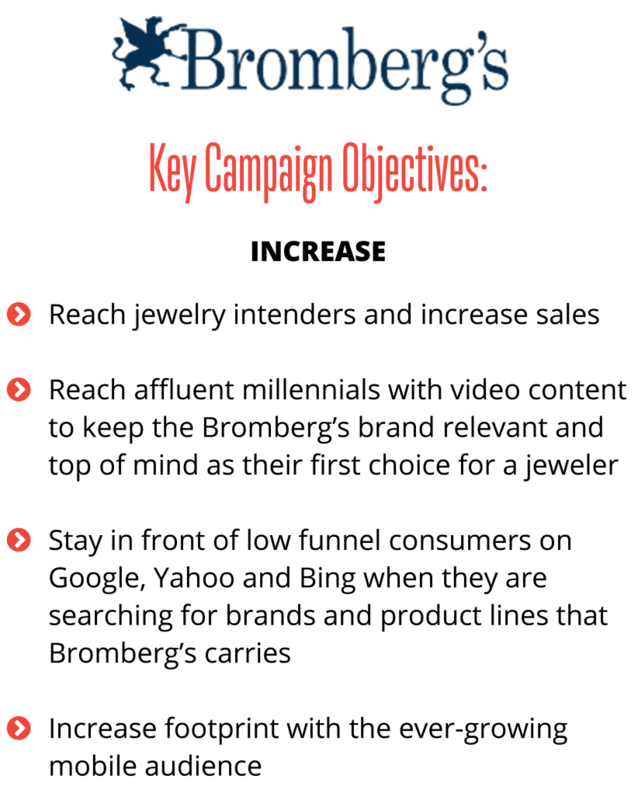 Bromberg’s came to Alabama Media Group with a goal of holding their position within the standard pillars of digital marketing like SEM and SEO while also deploying new tactics like mobile-only targeted display and video campaigns. 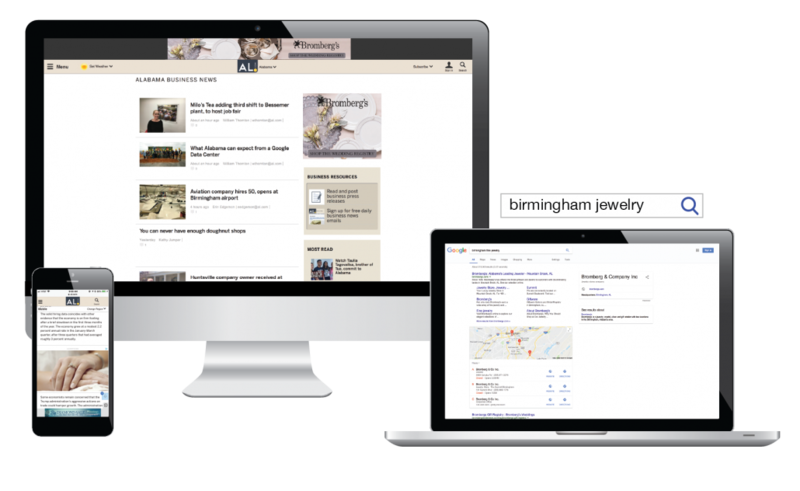 Find out how Alabama Media Group reached jewelry intenders, affluent millennials and low-funnel consumers, ultimately increased sales for Bromberg’s. The digital awareness campaign starts with sending the Bromberg’s message to a strategically designed target audience of affluent jewelry intenders. These users are targeted with display ads on AL.com and re-messaged with display ads on the extended network. 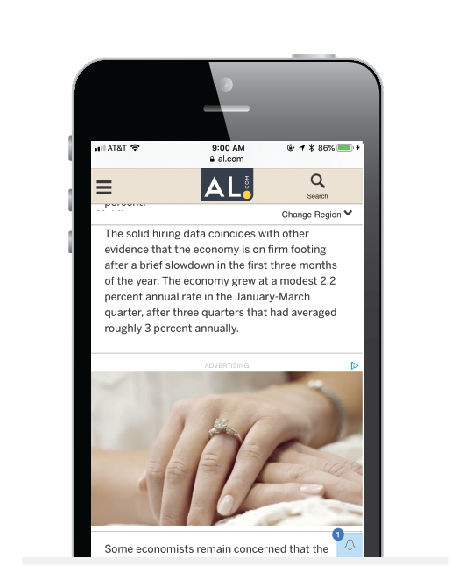 Alabama Media Group’s top notch creative services were utilized to implement a mobile-only expandable ad that showcased a gallery of engagement rings. 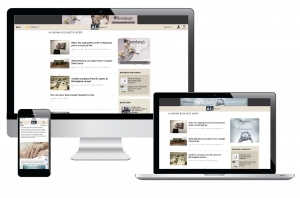 InStory video displayed Bromberg’s message inside articles on AL.com. This ad played automatically but required the user to rollover to the video for sound. Bromberg’s’ instory video set out to tell their story, highlighting their custom jeweler capabilities and specifically how special it is to be a Bromberg’s Bride. Timely sale-specific campaigns targeting holidays – Mother’s Day, Father’s Day, Christmas etc. 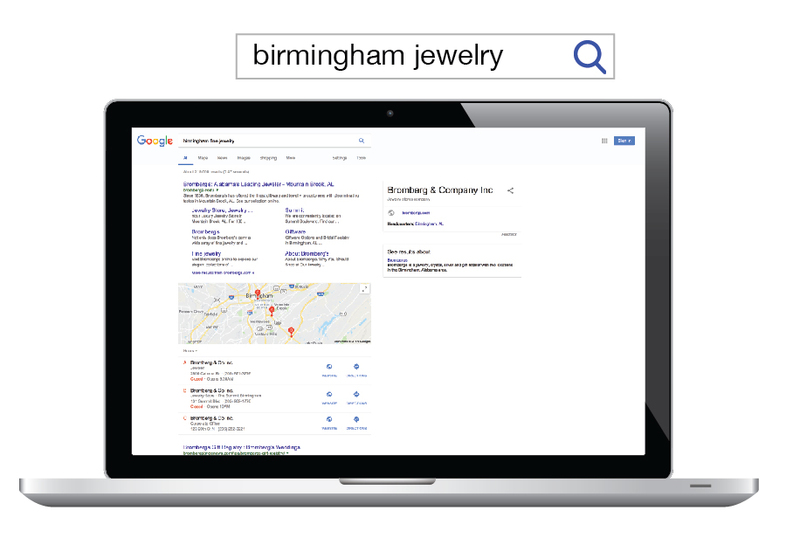 Utilizing Google’s sophisticated data, Alabama Media Group targeted users who have interest in certain categories that aren’t directly jewelry related – but we know those users are probable to also have an affinity for jewelry. Example: Targeting users who are luxury travelers or fashionistas. With this strategy, people who have been researching or visiting websites about diamond education were targeted as well. 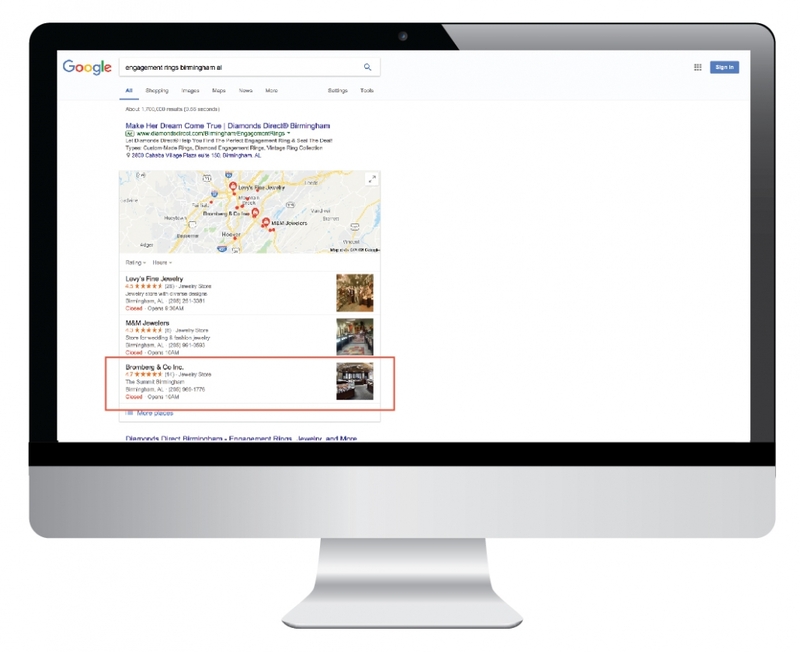 SEO was utilized in order to ensure that the Bromberg’s site shows up high in the search engine results page on Google, Yahoo and Bing. While using a strategic approach based upon the most up-to-date information about how Google, Bing, and Yahoo rank websites for relevant searches, AMG also focused on writing custom content throughout the year with the management of backlinks and offsite listings.